"BAR-LOCK · PAT'D OCT.13-1903 · MAY 24-1904 · 2/3 ACTUAL SIZE"
Represented in San Francisco by John McGuigan & Co. Corporations of New Jersey says "American Bar-Lock Co., Dissolved Jan. 12, 1905"
Feb, 1906 - Listed in The National Builder, under Prismatic Lights. In 1927/28 Sweet's they claim "30 years' experience in this line of business [sidewalk lights]"
Does any portion of the building in which you are interested require daylight? If so, why not get the best and strongest? SIDEWALK and FLOOR LIGHTS: Our patented "Bar-Lock" Sidewalk and Floor Lights need no introduction. The leading railroads, corporations, architects, engineers and builders throughout the country have endorsed them. They have superseded all other constructions. They are furnished in Porcelite, galvanized or painted with patented "3"-Point Prisms or "Arch Plain" Lights and can be installed by an ordinary cement man. They are made to any size and shipped in a few days after receipt of order. 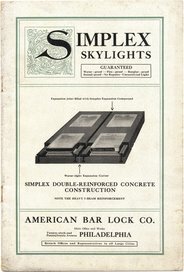 The Patented SKYLIGHT "3"-Point Prisms or "Arch Plain" Light System with "Bar-Lock" Porcelite Wrought Steel Construction containing cross steel channel bars locked into the heavy supporting steel bars, is adapted to all forms of overhead lighting and possesses advantages which give it preference over all others. Read the enclosed circular and if interested, send for special catalogue, prices, etc. Court Areas, Balconies, Porches, etc. Remarkable Results Obtained in Vault llumination. 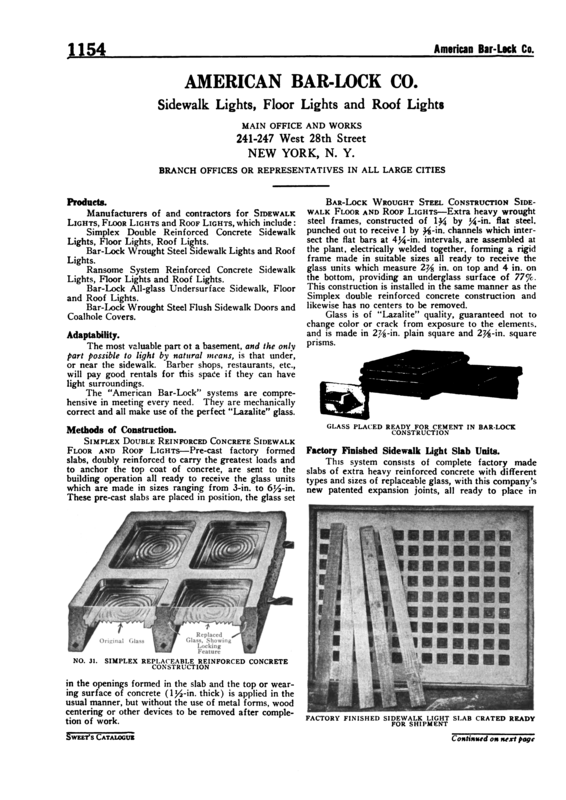 In proportion as the incandescent electric light outshines in brilliancy the ordinary gas jet, so Bar-Lock Galvanized Wrought Steel Construction and "3 Point" Prisms surpass in effective results every other form of vault, pavement and floor illumination. This bar-lock device is already recognized by leading architects and engineers throughout the country as the most satisfactory system of vault lighting yet devised. The points of superiority over the old form of cast iron frames are manifold. Its construction of wrought steel bars set on edge, with heavy channel bars intersecting at right angles, clamped in place, gives it rigidity and strength without being cumbrous. This plan of assembling provides for a 77 per cent of glass area, as against 25 to 35 per cent possible with weight sustaining safety in the old style cast iron frames. The steel, being galvanized, is virtually rustproof, while the grooved channel bars afford a deep interlocking rib of cement between the glasses, producing a thoroughly watertight binding. The "3 Point" lens is comprised of three distinct prisms of different angles in such a way that they diffuse light in three directions, producing the maximum degree of refraction. For vault locking Bar-Lock and "3 Point" Prisms have proved their effectiveness, as basements and cellars where they have been installed require no artificial illumination during daylight. A strength test showed the Bar-Lock capable of sustaining a weight of 384½ pounds to the square foot, without any appreciable deflection. The American Bar-Lock Company has recently completed its new factory at Twenty-sixth street and Pennsylvania avenue, Philadelphia, Pa., and has moved its offices to this location. Bar-Lock and "3-Point" Prisms Installation. An important and valuable improvement in the detail of building is the Bar-Lock Galvanized Wrought-Steel Construction and "3-Point" Prisms, which device is now being generally employed in large modern structures either for pavement-vault illumination or for the lighting of floors in warehouses and stores. 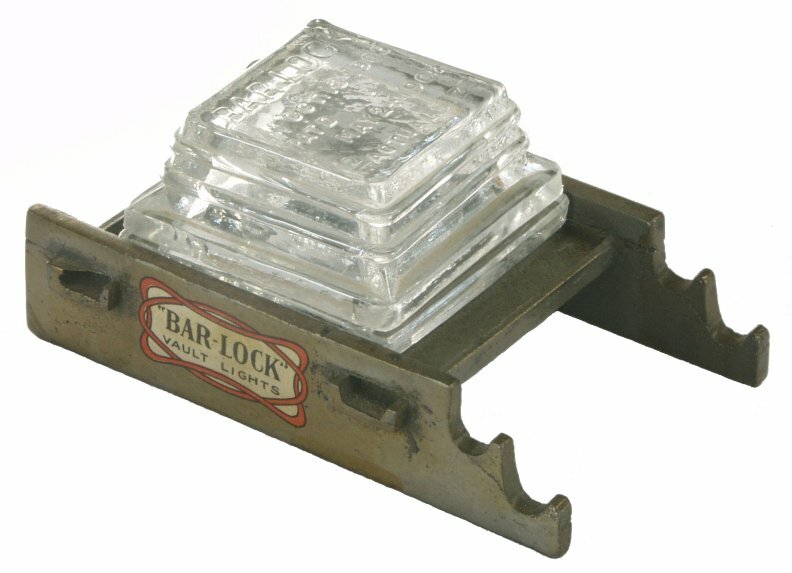 Bar-Lock has several points which recommend it over the old form of cumbrous cast-iron frames. Its construction of steel bars set on edge, with channel bars intersecting and clamped at right angles, gives rigidity and strength. This latter essential quality is illustrated by the fact that in a recent test a section of Bar-Lock and "3-Point" Prisms withstood a distributed weight of 384½ points to the square foot, showing only 3-32 of an inch deflection, which was recovered immediately upon the load being removed, indicating rigidity, strength and elasticity under extraordinary conditions. cast-iron frame is from 25 to 35 percent of the whole exposed surface. Bar-Lock with "3-Point" Prisms gives 77 per cent, an increased of 100 per cent. The "3-Point" lenses refract the maximum degree of light, each of the triple prisms deflecting rays independent of the other. The effect of this action is at once satisfactory and attractive. One user of their system declares: "The wonderful results obtained from your beautiful installation exceeds even my most sanguine expectations. The effects are dazzling, and I consider it the best system I have ever seen." 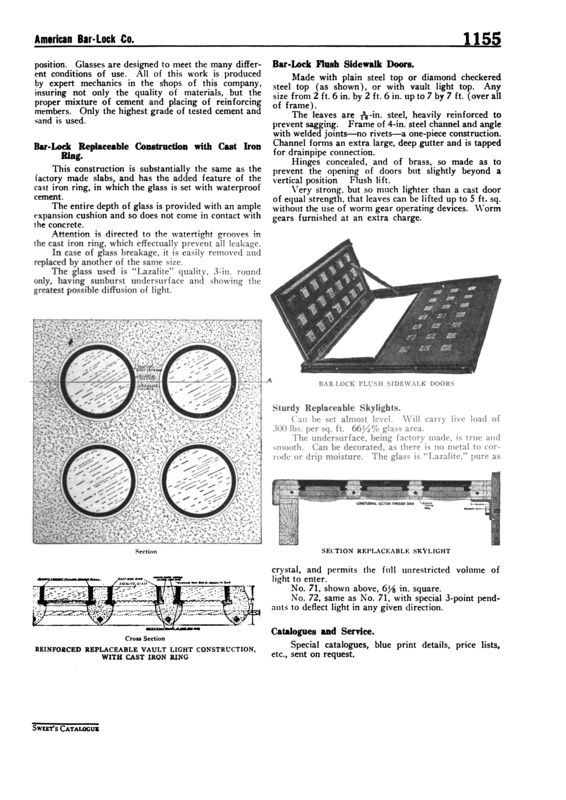 By the use of cement between the glasses—"3-Point" Prisms or "Arch" plain lenses—makes a thoroughly water-tight binding around and under each glass, so that there is no possibility of leaks. 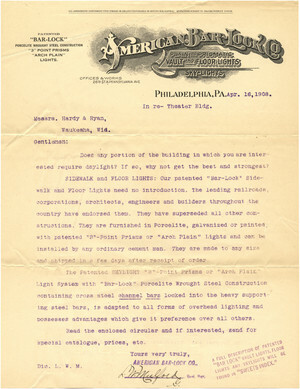 The American Bar-Lock Company has recently occupied its new and enlarged factory and offices at Twenty-sixth street and Pennsylvania avenue, Philadelphia, Pa., the enormous demand for the system making it necessary to increase the facilities for production. 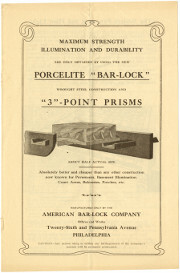 An illustrated catalogue has been recently issued giving details of the construction of Bar-Lock with "3-Point" Prisms and showing the various uses to which it is applied.